Has it really been seven months since I last posted? I miss all these ancestors and the warm embrace each of their letters still hold. Maybe you do too. I'm kicking off this next set of posts with letters from Sushannah Atkinson Haskins. My 2nd Great Aunt on my father's father's side. Between 1933 and 1948, Sushannah and her daughters, Edith & Dorothy, sent letters from their home in Brisbane, Australia to my Grandfather Benjamin and his sister Nelly Draisey Atkinson in Salt Lake City Utah. 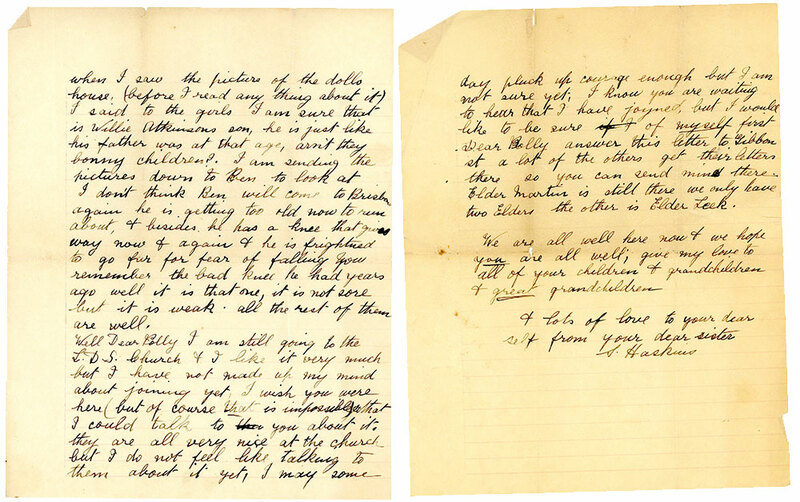 I suspect the letters sent to Nelly found their way into my grandfather's belongings when she passed away in 1967. I have no way of knowing this for certain. In fact, there is very little I know about my father's father's side of the family except for what I discover in these old letters and all the fantastic resources on Ancestry.com and newspapers on Newspapers.com. Slowly. Patiently. Bit by bit their lives are taking shape. I wonder, had they the tools then as we do now to communicate instantly - Skype, Twitter, WhatsApp, Facebook, Instagram, Snapchat, Text etc - had they had those tools, would they have stayed in touch more frequently? Would I know them better because of it? Or would things be the same, us all hurriedly chasing long lists of responsibilities as we attempt not to miss any of the intricate details of life? So busy with so little time to keep track of one another? I'll never know. I can only advance with the knowledge I have at my fingertips and put the past forth for others to discover should they, like me, go looking. So, About Sushannah. Sometimes Susannah. Sometimes Susanna. Sushannah, is the daughter of Charles Atkinson (1838-1903) and Charlotte Bower (1837-1898), sister of Charles Atkinson Jr. (1862-1926) who is the father of my grandfather Benjamin Atkinson. Sushannah was born on September 3, 1868 in Bradford Yorkshire England. She married John Haskins (1862-1930) 13 Jul 1887 in Queensland Australia and they had six children in 10 years; Charlotte, Edith, Margaret, Dorothy, Ellen and John Jr. She died on December 21, 1950 in Queensland Australia at the age of 82. I discovered more as I read the letters. You will too. This letter was sent to my great grandmother Mary Draisey Atkinson, wife of Charles Atkinson Jr.. (See above.) Mary passed away 2 months after receiving this letter. I should have answered your letter some time ago but I know you will forgive me, (like every thing else with me I have to be in the mood for it, it is no use me writing if I don’t feel like it). I have just had a fortnight in bed with influenza & I feel a bit shaky but I am on the mend now. I was very pleased to get the pictures of the twins etc. I took them down to the church & showed them to al the people there & they were all pleased to see them & all who know you wished to be remembered to you. I showed them to President Tingey & his wife who happened to be in Brisbane on a visit from Sydney. President knows your Ben & Willie they did some work for him once when he was in the building business over there, they both sighed to be remembered to you all. When I saw the picture of the dolls house, (before I read anything about it) I said to the girl I am sure that is Willie Atkinson’s son, he is just like his father at that age, aren’t they bonny children? I am sending the picture down to Ben to look at. I don’t think Ben will come to Brisbane again he is getting too old now to run about, & besides, he has a knee that gives way now & again & he is frightened to go far for fear of falling. You remember the bad knee he had years ago well it is that one, it is not sore but it is weak. All the rest of them are well. Well Dear Polly, I am still going to the LDS Church & I like it very much but I have not made up my mind about joining yet, I wish you were here (but of course that is impossible) so that I could talk to you about it. They are all very nice at the church but I do not feel like talking to them about it yet, I may some day pluck up courage enough but I am not sure yet; I know you are waiting to hear that I have joined but I would like to be sure of myself first. Dear Polly answer this letter to Gibbon St a lot of the others get their letters there so you can send mine there. Elder Martin is still there we only have two Elders the other is Elder Leek. We are all well here now & we hope you are all well; give my love to all of your children & grandchildren & great grandchildren. - “Picture of the twins.” She must be referring to twins born to my great-uncle Charles William Atkinson (nickname Willie)(1886-1936) and Emma H. Vogel (1886-1946). They had twins three times! Muriel & June in 1915, Bernard & Bernice in 1920 and Martha & Marvin in 1922. This is the first time I’ve realized they had three sets of twins! Probably because I stopped with Charles W. after he tragically died when a gravel pit collapsed upon him. (You can read that story here.) I should have kept going when I saw he had ten children when he passed away. More sad is that many of these children were alive in my lifetime and I never met them. Somewhere buried in all these letters & boxes there must be photos of these twins! Perhaps Dad will recall some of them. - “Picture of the dolls house” has me stumped. I have not stumbled upon any doll house looking pics, yet. It is likely in reference to a home that Willie or Ben (my grandfather) built as they were both masons. - George Street Annerley South Brisbane, Queensland & Gibbon Street. I’m not sure why she wanted her letters sent to Gibbon Street. Based on today’s maps, it was located across the Brisbane River roughly a 30-40 minute walk from George Street. Perhaps there was a central post stop there? 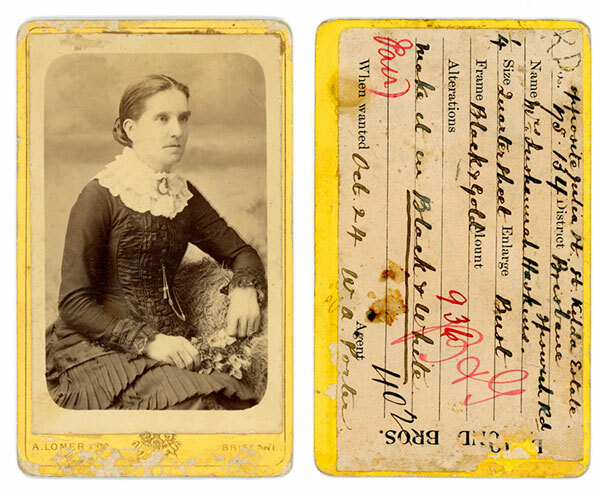 Once I finish up all my ancestors letters, I have to go to Brisbane and embark upon a genealogy tour to explore all the streets and locations referenced among the letters and postcards that Sushannah Haskins sent over. And of course, then I have to visit all the other Australia locations my ancestors lived in or visited. Virtually visiting them on Google maps just doesn’t cut it. Any Australian relatives out there looking to meet a long lost cousin?